I have been working on a book for quite sometime now. 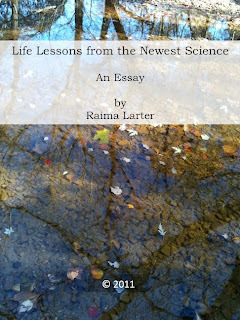 The working title is "God the Attractor: Spiritual Lessons from the Newest Science." The thesis of the book is that the many desires we experience in life - for people, places, things and experiences - are due to an organizing principle, an Attractor, at work in our life, tugging us toward the life we are meant to lead. In earlier posts, I have shown examples of attractors which govern the dynamics of physical systems, such as the Lorenz attractor discovered by Edward Lorenz while searching for a simple model of the weather. The Attractor I envision for our own life is similar: it is created by the behavior of that system and, yet, paradoxically, governs the system’s behavior in much the same way a gravitational field is created by, and yet governs, the motions of a planet. Much more complex than gravity, however, the attractor nudges and urges a dynamic system (such as an individual, organization or nation) into ever more complex and evolved behaviors. As I have worked with this concept I have become increasingly attracted (so to speak) to its possibilities for helping us understand what can be confusing times of life. 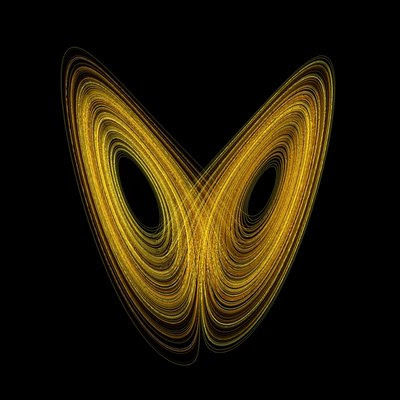 For one thing, attractors undergo dramatic changes in shape and form that are known as bifurcations. When a bifurcation happens, the fundamental character of the attractor changes, leading to deep and fundamental changes in the character of the trajectories governed by that attractor. The behaviors that were stable and desirable before the bifurcation become unstable and undesirable afterward. New attractions take the place of the old – this is evidence that a new attractor has come into existence. By the time we reach adulthood, all of us have gone through many bifurcations, including puberty, leaving home, perhaps becoming a parent or being diagnosed with a serious illness. In each of these cases, the attractor governing our life before the bifurcation point ceases to exist and is replaced by a new attractor, one whose form and influence on our life is not always immediately apparent. I hope to explore more concepts from this book project, a work-in-progress, in future posts on this blog. Your comments are, as always, very welcome. Today's image is from Chaoscope, software for 3D rendering of attractors. I have been fascinated with attractors ever since I realized that my life was probably governed by one. As I've explored this concept further, I've gradually come to understand that all our lives are governed by attractors that evolve over time, going through abrupt changes in form at key transition points. The attractor for one's life is not imposed from any external source but is, instead, generated by the very history--and future--of one's life. A famous example of an attractor was discovered by the late Edward Lorenz of MIT when he was trying to find a simple model for the weather. The attractor is a plot of the trajectories of the simple three-variable system Lorenz derived from more complicated and highly detailed weather models. This site allows you to generate your own version of the trajectories on this attractor, which is known as a strange attractor because it is a fractal. I urge you to try it yourself and observe how small changes in initial starting point lead to big differences in the pathway follows by the trajectory. The trajectories traced out by the Lorenz system with the parameter values used here are chaotic--which is why the system is so sensitive to small differences in starting point, a property of chaotic systems that has become known as "sensitivity to initial conditions." An attractor is a simple diagram that shows a system's history. In an earlier post, I described my first introduction to the Belousov-Zhabotinsky reaction, a chemical reaction that behaves in a very unusual way - instead of smoothly changing one set of chemical species into another, it oscillates between states. The attractor for a system such as this would be, quite simply, a circle. One way to graph data for an oscillating reaction such as the red-blue one, would be to plot the amount of one of the chemicals, the blue one, say, on the vertical axis against time on the horizontal axis. This way of graphing the data would produce a kind of wave going first up, then down with each oscillation of color; the up, down wave would repeat each time the color changed, producing an up, down, up, down, wavy curve across the page. Another way to graph the same data would be to plot the amount of blue chemical at any given time against the amount of red chemical at the same time. This kind of graphing technique produces a picture of the attractor. It looks different from the first one, but is constructed from the same data; instead of a wavy-looking curve going up, down, up, down from left to right across the graph, this graph is simply a circle, going round and round with each cycle of color change. The circle is the attractor for the oscillating reaction. Any rhythmic system (an oscillating pendulum in a grandfather’s clock, for example, or our heartbeat) has an attractor that is a circle. It is important to understand that the attractor is not imposed on the system from an external source. It is the chemical reaction itself, or more precisely the mechanism or chemical force field, that creates the attractor – and, even more to the point, it is our body which creates the attractors that govern the rhythms of our lives. Later, I will explore the implications of the idea that our lives are governed by attractors, probably strange attractors like the one that Ed Lorenz discovered when he was trying to model the weather. The implications for how we are to live our lives are, as we will see, profound. In a fit of organizational fervor, I've decided to schedule my posts. From now on, starting next week, I will be posting on Mondays, Wednesdays and Fridays. The mid-week (Wednesday) post will be short and will be called "Nearly-Wordless Wednesday," as it will consist only of an image with a short caption. The name for my mid-week post is borrowed from my friend Beth, whose own mid-week post on her reading and photography blog BethFishReads is called "Wordless Wednesday." Since I know I won't be able to resist telling you what the image is (I'm a recovering teacher), I can't go totally wordless like Beth does. Also, I will be choosing images with scientific meaning, because I'm a hopeless nerd and because they're really cool! To give you a taste of what those nearly-wordless posts will be like, here is a picture I happen to love. It is a new photo from the Hubble telescope and is of the planetary nebula designated NGC 2818, which lies in the southern constellation of Pyxis, also known as the Compass. 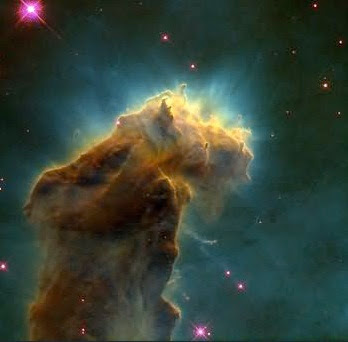 More info (and more beautiful pictures) can be found on the Hubble site. I could probably write a dozen posts on fractals, just to have an excuse to post more pictures of them. 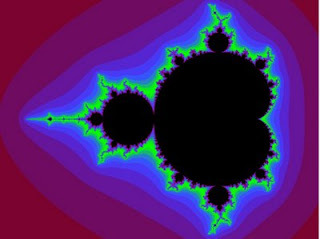 Here's another view of that most famous of fractals, the Mandelbrot set. There are quite a few websites where you can generate pictures of fractals on your own. One site aimed at students and teachers is Cool Math. Wolfram Mathematics has a downloadable "notebook" for the Mandelbrot set which uses its own Mathematica software, but you might also want to check out this simple Java applet by John Watne which generates fractal ferns. I haven't tried downloading it, but you can watch the applet run on John's website - gives you a good idea of how the iterative process used to generate fractals works. Finally, the Open Directory Project maintains a huge list of fractal generating software, including many art sites. If you'd like to browse some really snazzy fractal art, my friend Bruce suggests this site. Start exploring, and have fun with fractals! Thus begins the first section, “Fiat Homo,” or “Let there be Man,” of Walter M. Miller, Jr.’s classic science-fiction tale “A Canticle for Leibowitz,” first published in 1960. After winning the Hugo Award in 1961 and a flurry of subsequent honors it went through several printings and has never been out of print – for almost 50 years. Miller’s vision of a world torn asunder by nuclear war and embroiled in a struggle between the forces of religion and science is as relevant for our time as it was at the height of the Cold War when it was first published. Brother Francis is a monk in the Order of St. Leibowitz, a monastery in a ruined southwestern desert six centuries after humankind has nearly, but not quite, blown itself from the face of the earth in a nuclear holocaust. The monks of the Leibowitz order have devoted themselves to preservation of “The Memorabilia,” scraps of documents preserved for centuries and pointing to the existence of a once-great civilization which had apparently existed prior to The Simplification. This purge had targeted those the masses held responsible for the destruction of the earth—namely scientists, engineers and other learned folk. As Francis gazes upon the holy relics the John-the-Baptist-like figure has just led him to, he murmurs, hands trembling, afraid his shaking will destroy the fragile fragments of paper, “Beate Leibowitz, ora pro me!” First there is the Holy Circuit Design attributed to one I. E. Leibowitz. Next is the Holy Shopping List: “Pound pastrami, can kraut, six bagels—bring home for Emma.” The relics Francis holds in his violently-trembling hand appear to be written in the blessed Leibowitz’ own handwriting. The pages which Francis has just discovered will be added to The Memorabilia and incorporated into the litanies and rituals of the monastery: “From the place of ground zero, O Lord, deliver us; From the rain of the cobalt, O Lord, deliver us…From the curse of the Fallout, O Lord deliver us.” The monks will work tirelessly to translate and understand the Leibowitz documents they have so lovingly protected until, one day, centuries later, in a story recounted in the book’s second section, “Fiat Lux,” or “Let there be Light,” they manage to re-invent the electric lightbulb. News of their discovery spreads to the surrounding world, struggling its way back to civilization, and to one Thon Taddeo, Scientist. The novel is engaging, funny, horrifying, entertaining and deeply profound. I was in tears after the account of the first meeting between the Thon and the monastery’s current Abbot. The Abbot greets the visiting scholar: “’Welcome in the name of Saint Leibowitz, Thon Taddeo. Welcome in the name of his abbey, in the name of forty generations who’ve waited for you to come. Be at home. We serve you.’…For a moment his glance locked with the scholar’s. He felt the warmth quickly fade. Those icy eyes—cold and searching gray. Skeptical, hungry, and proud. They studied him as one might study a lifeless curio.” It turns out that the Thon is not so much angry that the monks have worked for centuries to preserve the beatified Jewish engineer’s knowledge but that they have beat the Thon, a real scientist, to the discovery he has long sought. Scientists, it seems, have not changed much in this imagined future world. The final section of the book, “Fiat Voluntas Tua,” or “Thy Will be Done,” haunted me for weeks after finishing the book. The savior of the world that emerges in this last section will surprise and, perhaps, horrify you. It will certainly give you much to think about as Miller forces us to ponder what makes us human, what it is about Life that impels itself into existence and where God might be in all of this. “A Canticle for Leibowitz,” is fully deserving of its three-time designation as the best science-fiction novel of all time. It is, in short, a masterpiece, and one fully relevant to our own turbulent time. Today is the 200th anniversary of Charles Darwin's birth. Fifty years later he published "On the Origin of Species by Means of Natural Selection," and the world of science has never been the same. Today also happens to be Abraham Lincoln's 200th birthday, a strange and almost awe-inspiring historical juxtaposition, but a story for another blog post. Darwin's theory focuses on how life evolves, but not so much on how it arose in the first place. Still, his belief that the evolution of species, one into another, could be described by natural law has influenced other scientists searching for explanations for how life arose on the earth. Several ideas have been put forth involving molecules of life arising in the prebiotic soup and coming together in some way to form a living thing. The images shown here illustrate how such a thing might have occurred. The color image is a snapshot of a chemical reaction (more on that below) which organizes itself into spiral wave patterns. The black-and-white image looks quite similar but is, remarkably, not a chemical reaction at all but a field of slime mold amoeba organizing themselves in response to a food and water shortage. The similarity of the two images has inspired a generation of scientists to determine what exactly is going on that makes these two systems produce such strikingly similar behavior. Darwin began his university studies in medicine, following in his doctor-father's footsteps, but neglected his studies so much his father pulled him out of school and sent him off to Cambridge to study to be an Anglican clergyman. Although he was never ordained, he was much influenced in his studies by naturalists who were also theologians. Many scholars have studied Darwin's writings, trying to determine what this man really believed, but we may never fully know the truth of this. However, it is clear his scientific work was originally influenced by and, in fact, would always be intertwined with religion. I was introduced to this subject when I was 19 years old and an undergraduate at Montana State University. I had just slipped into one of the lecture halls in the chemistry building. A slight, bearded man stood at the front of the room setting up a large flask into which he poured a clear blue liquid. As more people entered the room and took their seats I settled into a chair in the back, trying to look like I did this sort of thing every day, and watched as the man switched on the stirring mechanism. Blue liquid began to swirl in the flask. The man, who I later learned was Richard Field, a new chemistry professor at the nearby University of Montana, began his lecture, talking about things I didn’t understand but using words which fascinated me—inorganic reactions, chemical kinetics, catalysts. I tried to concentrate on the unfamiliar topic, but my attention kept shifting to the blue liquid, swirling furiously in the tall, conical flask. I stopped listening altogether when a few streaks of red appeared in the blue. Before the red streaks had traveled even once around its perimeter, the entire contents of the flask blinked to red. Members of the audience gasped and Dr. Field, a wiry man with twinkling eyes, stopped talking and shot a smile toward them. The red liquid, just as suddenly as it had appeared, flashed back to blue. The crowd gasped again and the bearded man smiled broadly, like a magician playing to his audience. As we watched together, amazed, the liquid in the flask began an alternating display of color: first red, then blue, then red again followed by blue – the flask oscillating between one color and the other every minute or so. "It's called an oscillating reaction," Prof. Field explained. He had driven the distance from Missoula to Bozeman that day to meet his new colleagues at MSU. Prof. Field went on to explain that the oscillating behavior, quite unusual for chemical reactions, was an example of a larger class of behaviors called self-organization. The name, he explained, comes from the fact that the chemical reaction organizes itself into orderly patterns in either time or space—the alternating pattern of red and blue doesn’t come from anything outside the beaker, but, rather, from the interactions between the chemicals themselves. You can see a picture at the top of this post of the patterns produced when this chemical mixture is poured into a petri dish. I was sitting in that audience listening to Prof. Field because I’d been trying to figure out what to do with my life—or, like many 19-year-olds, what my major should be —and somebody had suggested I attend the lecture to see if Chemistry might be it. I had been recruited to MSU the year before by the engineering school, offered a scholarship because (a) I had good math scores and (b) I was a girl. While it was true I was good at math, I was actually a rather unlikely prospect for science. For one thing, very few people in my family had a college education. I grew up in Idaho in a town—Idaho Falls—that, while the second largest “city” in the state, had only about 35,000 residents at the time. Fathers of my friends were an odd combination of potato farmers and nuclear physicists due to the fact that the largest employer in town was the Atomic Energy Commission (AEC). The AEC lab, known in those parts as “the site,” holds the distinction of being the home of the world’s first ever breeder reactor, used to convert radioactive Uranium into Plutonium. We often camped out, spreading our sleeping bags directly under the stars. Lying on my back and gazing up into the Milky Way never left me feeling insignificant and small in the face of such vastness but, rather, awed to be part of the great, wonderful mystery called the Universe. The thought of my “self” looking out through my eyes at the stars and being able to know that I was doing that always left me feeling a little bit scared; who was I, anyway, who even knew I was here? I had always had a lot of questions that half-scared, half-excited me. These moments were my first glimpse of what I would later come to think of as the Attractor in my life. They were also the first formulations of what I called my Big Question: "How is it that I know I am here?" I am still trying to determine if this was a religious impulse or the beginning of my scientific career. Perhaps it was both. Although I’m certain I didn’t understand this at the time, I learned later that the red/blue oscillating reaction which I had observed in Dr. Field’s lecture is a simple inorganic reaction, undistinguished in its details and very much like many other chemical reactions. One key component of the reaction—known as the Belousov-Zhabotinsky reaction after its Russian discoverers—is a catalyst molecule whose color is red in one form and blue in another. The color changes occur as the catalyst cycles between these two states, slowly converting the reactants into products in the closed flask. By the end of Dr. Field’s lecture, the near-cyclic reaction (actually more of a decreasing spiral) had run its course and the red and blue flashes that had made the flask seem almost alive had ceased. Filled with a murky purplish-colored liquid, the flask and its contents no longer looked particularly alive to any of us in the audience. In later years I would see even more experiments with this fascinating reaction, including those in which the beautiful traveling waves seen above are produced when the chemicals are simply poured into a petri dish. But I couldn’t stop thinking about it. What made the colors change like that? Nothing I had ever seen in my growing up years—except the bubbling mud pots and geysers in nearby Yellowstone Park—could match this spectacle. After I heard Richard Field’s talk, I attended another lecture, one of a campus series. In my quest to figure out what my major should be, I decided to go to them all. This particular lecture was given by Dr. Stanley Miller of the University of Chicago. He spoke in a packed auditorium about his now-famous experiments carried out with Dr. Harold Urey of the University of California - Berkeley. The Miller-Urey experiment attempted to reproduce conditions present on the early earth at the moment life first appeared. Miller and Urey mixed sulfuric acid with several other chemicals to simulate the early ocean—the sulfuric acid mimicked the run-off from volcanoes—and placed the mixture into a large flask pumped full of methane and carbon dioxide, the likely components of earth’s early atmosphere. Then, they shot electrical charges through the entire apparatus to mimic the action of lightning storms. When Drs. Miller and Urey and their students inspected the contents of the flask they found, lo and behold, amino acids—molecules which, when chained together, form proteins. The electrical discharges had apparently caused the atoms in the carbon dioxide, methane and sulfuric acid molecules to rearrange themselves into new molecules, the very building blocks of life. These amino acid molecules were not alive, of course, but the fact that amino acids were formed, as opposed to, say, the building blocks of plastic, was astounding to me. As I left the lecture hall that night, swirling in a crowd of students and professors into the cold Montana evening, under a blanket of stars that were always brilliant in that high-mountain town, my brain lit up with a thousand questions: When does a soup of molecules pass from being just a bunch of chemicals to being alive? Could a solution of amino acids keep on changing, organizing themselves—somehow—into a life form? And, if so, how in the world could they do that? The chemicals in Miller and Urey’s flask were not alive, and neither were the ones flashing red and blue in Richard field’s demonstration of the Belousov-Zhabotinsky reaction, or BZ reaction for short—but the juxtaposition of those two lectures ignited a series of questions that I could not turn away from. Dr. Field’s explanation of the oscillating color changes as an example of self-organization intrigued me. If a simple chemical reaction could organize itself like that, what might a soup of amino acids do? Giving the mysterious process a name—self-organization—told me that these scientists, the ones who presumed they could name a phenomenon as amazing as this, might be able to guide me toward answers to the host of questions that crowded my mind after those two lectures. Maybe science held the key to finding the answers I sought. So, here I am, decades later, still thinking about these things and delighted to be able to share a little of what I've learned in the process of finding answers to my Big Question. Here is a section of the most famous fractal of all, the Mandelbrot set, named for its discoverer, Benoit Mandelbrot of IBM. I wrote in an earlier post about fractals in nature -- broccoli of all things. The essential feature of a fractal is that it is a self-similar object. All parts of the object are copies of the whole. Fractals have a deep and profound connection to chaos. More on that in a later post! The annual Hajj ritual in Mecca has been made safer in recent years by, of all things, Physics. In a recent post, I wrote about the huge crowds at the recent presidential inauguration and how relieved I was that stampedes did not break out. Popular Mechanics recently wrote about work done by Dirk Helbing, a professor of sociology at ETH in Zurich, and his colleague Anders Fredrick Johansson with officials in Washington DC. The group made changes in the planned layout of barriers using the physics-based approach of Helbing and Johansson, shown to be highly successful in the prevention of stampedes. 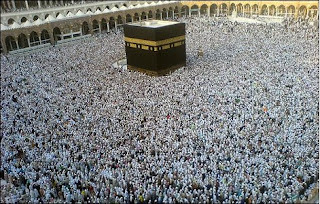 This same approach has been used to make the Hajj, an equally large gathering, a much safer event than it has been in the past. In an even earlier post, I wrote about the shared space movement, an approach to traffic control that advocates the removal of signs, street markings - even curbs. The shared space approach can be understood by comparing traffic to a flock of birds or school of fish. When birds flock, no one bird is in charge, yet the group moves in an orderly fashion. The flock functions as it does because each bird senses the position and direction of motion of its neighbors and adjusts its own flight to match. The result is self-organization, a smooth and even dance-like movement of the flock. Both of these approaches to crowd control are based on the idea of self-organizing traffic flows, a concept borrowed from physics where it is used to explain the behavior of complex systems as diverse as the turbulent flow of fluid through pipes or the swarming of insects. Shared space advocates “are trying to use the concept of self-organization to improve performance,” Helbing explains. Crowds of people move the same way as flocking birds, explains Dr. Helbing, if given the opportunity to interact with each other. The ability to make eye-contact is key to the success of shared-space. Drivers and pedestrians have to acknowledge each other’s presence, then adjust their behavior to those around them. The annual Hajj ritual that attracts millions of Muslim pilgrims to Mecca is one area where Helbing’s ideas about guided self-organization have had surprising and profound impact. In recent years, tragic stampedes have occurred during the Hajj, leading to the deaths of hundreds – 251 people died in 2004 and 362 more in 2006, all trampled under the feet of panicking pilgrims. Helbing’s work has attracted the attention of Saudi authorities who hoped to prevent more such tragedies. After studying video footage of the crowd at Mecca, Helbing noticed that the movement near a narrow entryway onto the Jamarat bridge was smooth like slow-moving water until just before the stampede broke out. The video, which can be viewed here, shows that, as the crowding near the bottleneck becomes heavier, the flow goes from smooth to a stop-and-go forward motion Helbing calls “shock waves.” Suddenly, without warning, a different kind of movement begins– rapid back and forth motions in a direction perpendicular to the flow of the crowd. This lateral motion, explains Helbing, is a signature that the flow is about to go turbulent, like water flowing through a hose when the faucet is suddenly turned on full-blast. Indeed, shortly after lateral movements appear in the crowd, panic breaks out. The video is difficult to watch. Even though the footage shows only dots on the screen, it is hard to escape the knowledge that the dots are people, some of whom are falling under the feet of others and dying. Helbing recommended a redesign of the entryway to the bridge, including some one-way lanes. These changes in design take into account the self-organization of the crowd Helbing observed in the video data. Since implementing Helbing’s recommendations, no further stampedes have occurred. Wired wrote about this work last year. I, as one of those little particles who self-organized ourselves into an orderly flow on the National Mall in Washington DC two weeks ago, am very happy that Dr. Helbing and his colleagues have continued to find ways to apply interesting theories from physics to the problem of controlling a large crowd. What could have been a day marked by tragedy that has become all too common was, instead, a fully joyous occasion.